The following chart from U.S. Global Advisors is pretty amazing. 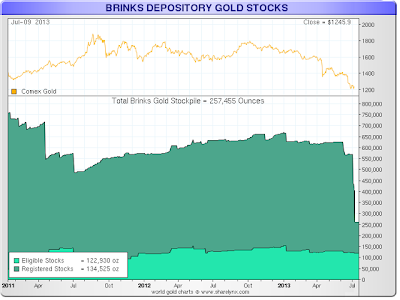 The grey area in the chart shows total worldwide global gold production. That is new supply. 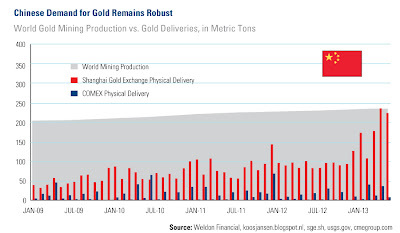 The red lines show the Shanghai gold physical delivery or a representation of China's gold accumulation. The blue line shows the COMEX physical delivery. The paper price of gold is set on the COMEX in America, which is controlled in the short term by the paper contract players. 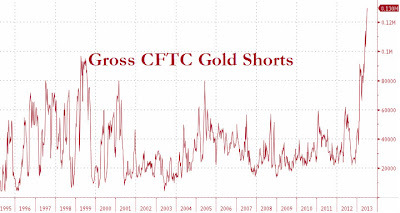 On the COMEX exchange, it is widely known that the physical gold is just a fraction of the paper gold it backs, making the idea that gold prices are set by that exchange almost laughable. It is a game of musical chairs at the COMEX and the first sign of a run will wipe out their available physical gold instantly. In other words, they will have to "settle" contracts in paper, sending people a check in the mail at the time they will need their physical metal the most. We have discussed this COMEX topic many times over the past few years so it is nothing new. What is new is what has occurred just this past week at the Brinks Depository. The CME is reporting they have had a 70% decline in their available physical metal, which is the cliff drop on the bottom side of the chart below. Where has this metal gone? This is just a small taste of what is to come during the run on physical. I have no idea how low gold will go before the paper price bottoms, but the scenario above which is the artificial paper price meeting what is actually taking place in the physical world, is what will set up the final super spike in prices. Do you compare these supply and paper-versus-metal calculations for gold with similar numbers for silver in a recent post somewhere?